Umbrella octopus | The Umbrella Octopus are a group of octopus that frequent the open ocean (pelagic). As their name implies, they are best known for their manner of swimming through open water with their body flared like an umbrella. They are assigned to the taxonomic family Opisthoteuthidae, which contains four genera. 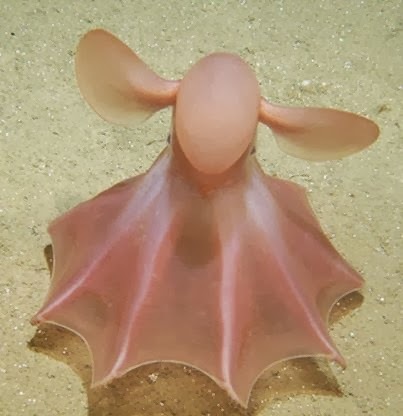 The type genus of this family is the Opisthoteuthis, which includes the Flapjack Octopus also named for its behavior of flattening itself like a “pancake”. An octopus’s key mechanism to defense is camouflaging itself. An octopus usually has 3 colors in its skin cells (some can have up to four) to change its color. The camouflage of an octopus is very essential for not only one specific octopus because it can affect the rest by warning them of danger. As well as uncharacterizing itself as an octopus from its predators. An octopus relies upon its skin cells, for survival because it can not only change its color but its texture to match up with seaweed or coral etc. Octopuses have several secondary defenses (defenses they use once they have been seen by a predator). The second way the octopus defend itself is by its ink sack, which it releases as a cloud (this ink is melanin). This ink is simply useful in de-coding smell to the predator, which then helps the octopus get away quickly and safely. Some octopus, for example the Mimic Octopus, can mimic other animals and change its color and texture closer to theirs (animals like lionfish, sea snakes, and eels).